PinHole - Reader Glasses - ThaBadbrey Herbal. Why Wear PinHole – Reader Glasses ? 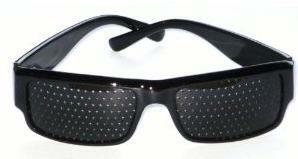 “PinHole – Reader Glasses” are a type of specially designed “Spectacles”, that appear at first glance to be a form of Normal “Dark Sunglasses”. However, upon closer inspection, one will realise that in the place of where the lenses of the glasses are usually familiarly located, are instead a large number of pinhole-like gaps/holes, hence the name “PinHole – Reader Glasses”. These “holes”, allow the eye to re-learn how to optimise focus and thus “see” correctly once more, without the equipment itself causing any health detriment regarding the visual efficacy of the actual eye itself. Rather, it improves eyesight overtime, dependent upon frequency of use. Wearing these eye apparatus for just 5 minutes daily while reading(highly recommended) or in conjunction with carrying out daily chores within your own home, can result in major improvements with regards to vision. Here at ThaBadbrey Herbal., we are dedicated to the continued increase of the Vibrational Frequency of this planet as a whole, via the means of assisting in the initiation and/or maintenance of the Higher Vibrational Health & WellBeing of all who reside upon this celestial mother of ours, planet Earth. Hence, the reason why this product has been made available to all who so require and/or wish to greatly improve their own eyesight, as well as that of other acquainted individuals, who may also gain major health benefits, from the use of this amazingly-simple, yet amazingly-useful visual device. “PinHole – Reader Glasses” are available, exclusively, here at ThaBadbrey Herbal., and yet, still for an Extremely Reasonable & Unbeatable Price, of just £5:00 per pair! Order your pair of “PinHole – Reader Glasses” today, and prepare to decrease (or Remove Completely) your perceived(or shall I say “Propagandised”) need to wear EyeGlasses/Spectacles, within just 3-4 weeks (approx.). ClickHere for More Info on Vision-Improvement Techniques & Eye-Health in General. When using this device, it is of advisory importance that the user ensures, that the area in which the device is being used, is well lit with sufficient lighting as a means of keeping the vision of the user, of said device, as clear and unobstructed as possible, due to the fact that the device in question may have an acutely obstructive effect upon the peripheral vision of the user whilst being worn. This is due to there being present, No pinholes within the sides and/or handles of this device. It is also, therefore Not recommended that the aforementioned visual apparatus alluded to above, are to be worn whilst partaking in any activity, which requires a full range of human vision. These activities include, but are not exclusive to, driving, crossing a road and/or street, or any other activity which requires a substantial amount of spacial and/or visual awareness. For Example; Wearing PinHole-Reader Glasses, while carrying out the task of flying an Aeroplane, or driving a heavy goods vehicle, is Not condoned, endorsed or recommended by ThaBadbrey Herbal. and we can Not be held accountable and/or responsible for any results, of the actions of any individuals who choose to partake in such practices.